I got it while I was studying abroad in China and visiting Hong Kong, a few months after she passed away. I wrote [the following] poem after visiting Tai Shan or Mount Tai, one of the 'Five Sacred Mountains' in China. According to Wikipedia 'it is associated with sunrise, birth, and renewal.' "
a man offers to carry you—refuse. with his beak, you need patience. write it on the walls, the dry stones bleach. Shana Wolstein has her MFA from Western Michigan University in Kalamazoo, where she was the 2011 recipient of the Herb Scott Award for Excellence in Poetry. She has been published by Third Coast Magazine, Anomalous Press, Hinchas de Poesia, OVS Magazine, and more. Still in Kalamazoo, she works as Coordinator for the Prague Summer Program and Managing Editor of the academic journal Reading Horizons. 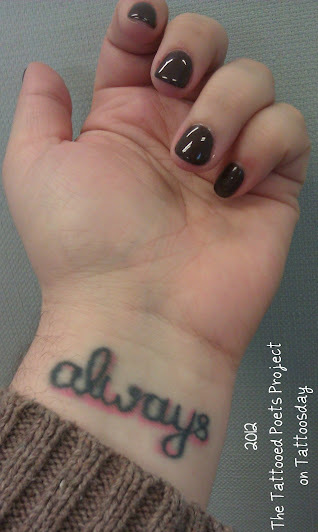 Thanks to Shana for sharing her poem and tattoo with us here on Tattoosday!